This sounds like it could be a motherboard problem. I had the same type of problem after an electrical storm a while back. Everything worked except the internet connection. I had windows 7 earlier and everything worked fine. I then changed to peppermint 7 and it was still working fine but a week back i changed my internet connection and my router from ADSL to normal broadband router and the ethernet has stopped working since then. 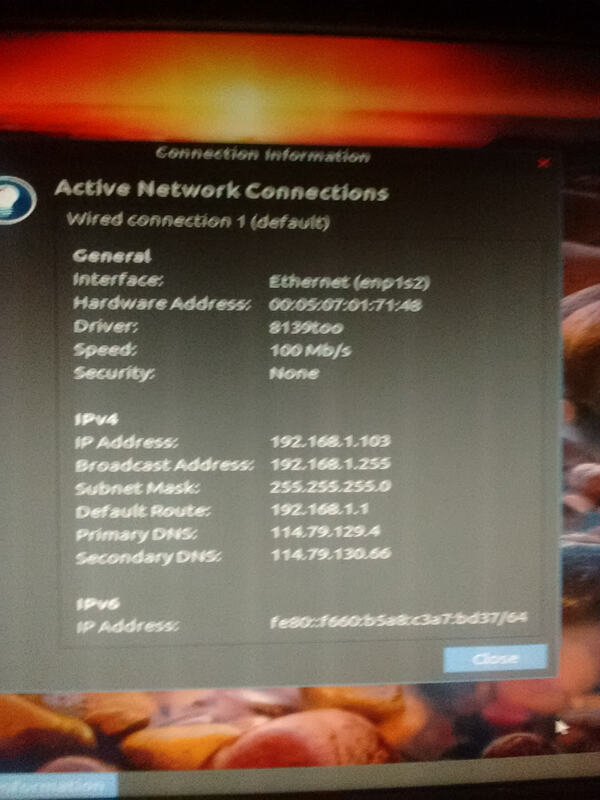 I checked the router and the cable by connecting it to my laptop which has both windows 7 and Linux mint and the ethernet worked fine on both the OS. The LED light on the ethernet port on the desktop turns on when the cable is plugged into it and similarly the LED light on the router for the corresponding port turns on as well so i am assuming that there is no problem with the LAN card. I was able to get internet on the desktop through my phone via usb tethering but that is not a permanent solution. Iam currently logged in from my desktop. The computer was assembled by a friend of mine years ago. It is very old Pentium 4 and has 1 gb of ram. If you need any other information then please do let me know. But the outputs you have already posted from the other terminal commands provide lots of good info about your setup. Okay I see nothing wrong in dmesg, but your ifconfig output suggests the adapter is not getting assigned an IP address via the routers DHCP server. and tell me what you see in the list ? 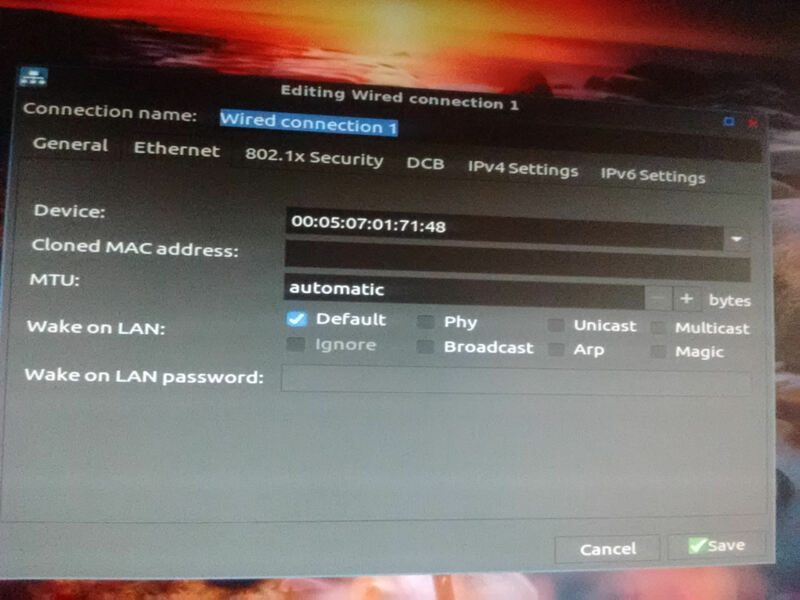 After running the first command it opens the network connection dialog box and it shows wired connection 1 , wired connection 2 and wired connection 3 . The wired connection 3 is the mobile that i have connected to get the internet on the desktop. @Slim Thanks for letting me know will keep that in mind in future while posting. Posting the output from the command that slim suggested maybe this will help you'll get some more info. hightlight "Wired connection 1", and click the "Delete" button. hightlight "Wired connection 2", and click the "Delete" button. Now click the "Add" button .. select "Ethernet" and click the "Create" button. I dont know if this information will be useful but the mobo had a built in ethernet which got corrupted a few years back and i had to install an external lan card which is the socket where i have currently plugged in the cable from the router. What happens if you disable IPv6 for the ethernet connection, and/or set a static IP ? 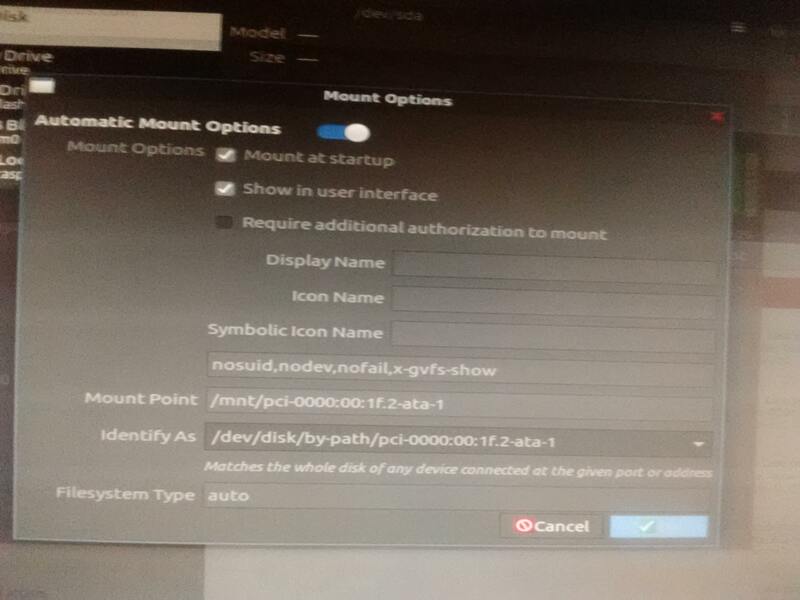 Can you go in your bios and disable on board lan , it might force peppermint to use your Pci Ethernet card instead? Before you try this wait until you hear more from PCNetSpec he might have more options for you. Hi Kavin, how's it going ? 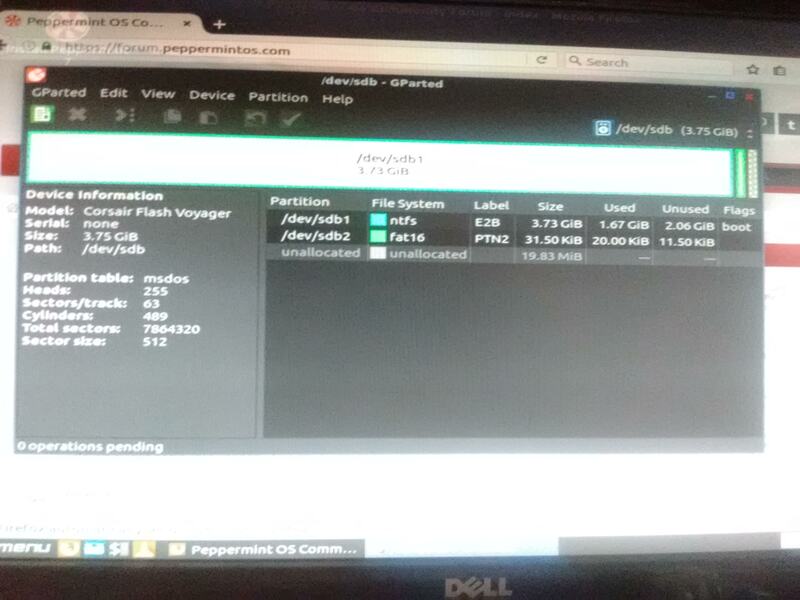 Wow, you've a splendid issue to add to the PeppermintOS knowledge base. You're in good hands with PCNetSpec. He's Peppermint's lead developer . For future reference, could you please remember to encapsulate all terminal outputs with the Insert, Code # function. For extra long outputs, please use the Spoiler, Sp function. If you’re a Chromium Browser and/or a Google Chrome user, please don't combine these functions. For some reason they don’t work well together with these browsers. Only use one or the other . These forum functions preserve the original format of the output. This makes it easier for future visitors to relate to their own issues. These functions are found in the forum editor, above the, Embarrassed and the Cry emoticon respectively. Use the Preview button to check how it'll look in the forum. This time, I've done it for you - many thanks . sorry i was not able to come online yesterdsay i had a new set of problems to deal with. Since I was able to get internet on the desktop and i noticed i had not updated the available updates i donwnloaded and installed the updates hoping that maybe that might help. The updates were done and everything was normal but when i rebooted it again i noticed that there was no display. I shut down and rebooted it again it booted up very slowly and i noticed that since i have a onboard lan card and an external lan card during boot time it always shows up both the cards but after booting it showed only one card. I was not sure if this was the onboard card or the external so i went into bios and checked that the onboard lan card was enabled. I disabled it. Hoping that this might make the software detect my external lan card and i booted it again and this time again there was no display. I tried 2 or 3 times to shutdown and boot up but no display. I thought maybe some cable must have become loose so i opened up the cpu and just checked the hard drive cables and the ram everything seemed ok so i booted it up again and this time it showed just one lan card during booting so i guess it detected the external lan card but it would not boot up all the way it stopped before it could load the login page and so i shut down and rebooted again and this time again there was no display. I decided to change the sata port as i had touched it earlier and the display came back so i assumed maybe the port was giving problems and i removed the cable from sata port 1 to sata port 2 on the mobo and powered up. This time it booted up but it showed me a pxe.rom error i realized the mistake i had done because the software was not able to find the hard drive to boot so i changed the cable again back to its original position and booted up this time it booted up but showed a series of errors which i could not understand i took a pic of the error with my phone and i have uploaded it on tinyupload here are the links to it. I am clueless how to go about this error any help would be greatly appreciated. It then went on to boot from the usb and showed me the peppermint 7 install screen. I chose to install peppermint os it then showed me the installation screen where i had to select the language when i clicked on continue it showed that the space required for the installation was 4.6 GB that was required and I had only 4GB so it was not able to detect my hard drive and it was able to detect only my hard drive. The only solace that i got while doing this is that a pop up appeared on the right hand corner stating that " wired connection 1 was established and i had disabled the on board lan and no phone was connected so it was the ethernet port which was detected and was working fine. i quit the installation and it took me to the live OS so i decided to look into the connection details of the ethernet and here are some snapshots in the link. I also looked into gparted and the disk uitlity to see if my hard drive was showing there but it was not getting detected at all, though it was showing up in the bios. here are some snapshots of the gparted and disk uitility. Has my hard drive gone kaput or is it something else? Okay your first image seems to suggest you have "Boot from LAN" (aka. 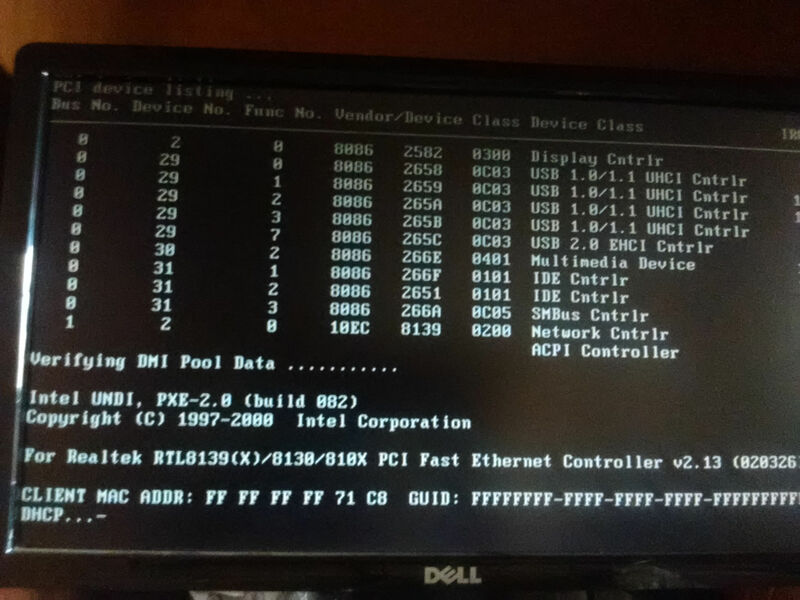 PXE Boot ROM) set in your BIOS with a higher priority than the USB stick. The good news is that at least you've proved the network adapter works. And did you change any BIOS settings to boot from the LiveUSB ? Do you still have Peppermint installed ? Looking at your picture of gparted your looking at you usb drive, where it says /dev/sdb 3.75 gig click the up and downs arrows does sda show up in the menu?